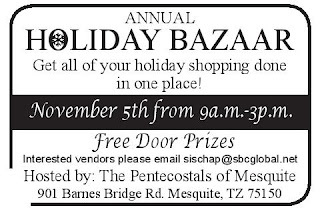 "Westminster Presbyterian Church (WPC) in southwest Fort Worth will host its annual Holiday Gift Market with nearly 40 vendors and crafters from around the Metroplex who will be on hand to help shoppers get a jump start on their holiday lists. The event is FREE for shoppers. 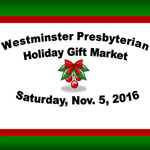 Vendor categories include bath & body, clothing & accessories, home décor, food, woodworking, and gifts for children, adults and more. There will be handmade holiday crafts as well as representatives from companies such as Scentsy, Thirty-One Gifts, Mary Kay, Stella & Dot and Tupperware. In addition, the Holiday Gift Market will offer chances to win raffle items. Tired shoppers can make a stop at our Cozy Café for a bite to eat. " At the southeast corner of Trail Lake & Altamesa Blvd. 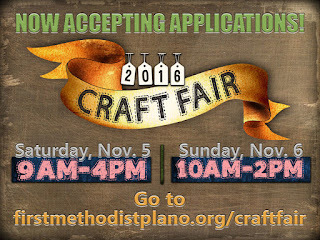 "The FUMC Plano Craft Fair helps fund mission efforts around our community and the world. We look forward to seeing you there! Visit our church website to learn more. " "The 15th Annual Snowflake Bazaar is one stop shopping for the holidays featuring seasonal items, floral design, gourmet specialties, jewelry, toys, candles, home accessories, ladies and children’s apparel, personalized items, handbags, shoes and so much more! There are over 100 vendors as well as food for purchase, including mini Nothing Bundt cakes. So come by to shop and eat and support the Plano West Band! Sponsored by the Plano West Band Boosters, this is the largest annual fundraiser for the Plano West High School Band. Admission is free." "Holiday Gifts all taken care of in just one place? Where? This is the place! 901 Barnes Bridge Rd. 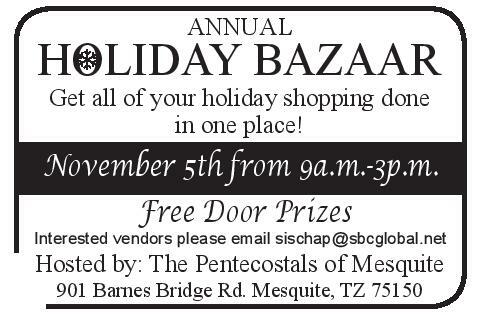 Mesquite, TX 75150 from 9:00am - 3:00pm. When? Sat. Nov. 5th, 2016 ONE DAY ONLY. Free Door Prizes and great gift ideas, from Candles, clothes, tutus, to of course the best weight loss products and hand made items! You just have to see it for yourself!" "Come out & get your holiday shopping done early! Browse lots of great vendors with a variety of awesome gift ideas! Jewelry, clothing, home goods, art & much more! FREE ADMISSION Don't miss the raffles & bake sale also!" "Come and shop for gifts from local vendors. 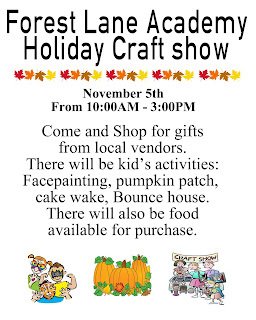 There will be kids activities: Facepainting, pumpkin patch, cake walk. There will also be food and drinks available for purchase." "Booth after booth of gifts, food, shabby chic/vintage, original art, crafts and more!!! Admission is $5 per person or $4 per person and 2+ cans of unexpired food for the Golden Food Pantry. Kids 12 and under are free with paid adult." Admission is $5 per person or $4 per person and 2+ cans of unexpired food for the Golden Food Pantry. Kids 12 and under are free with paid adult. "Come sip, shop and socialize. See the latest fashions, beauty and gifts for entertaining this holiday season. Door prizes every 30 minutes!" 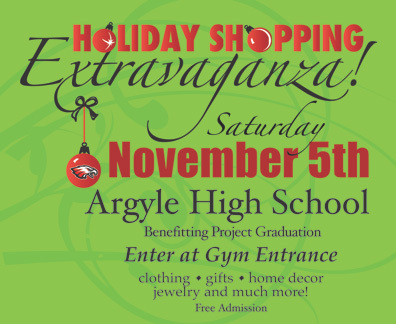 "Shop for unique, handcrafted holiday gifts, apparel, jewelry, home decor, food items and more Nov. 5-6 at Carroll Senior High School 1501 W. Southlake Blvd. Proceeds benefit Project Graduation. With over 160 vendors, there is something for everyone." "Keep it local! Shop handmade & support your local economy at the Funky Finds Holiday Shopping Experience! This FREE indoor event is family AND pet-friendly and features over 100 Artists, Crafters, Designers, Authors & Gourmet Food Makers selling their uniquely hand-crafted items. On-site pet adoptions, Toys for Tots drive, charitable raffle, paint classes, and photos with Santa Claus are just a small part of the funky fun!" "Rockwall's most anticipated craft fair is back for its 42nd year! Featuring unique vendors, crafts, gifts, and holiday decor, along with the best pecans in Texas! " Admission Fee: Entry is $1.00 or 1 can of food for Helping Hands Food Pantry. "This FREE event provides visitors an opportunity to enjoy family-friendly concerts, take a break in the beer garden, shop festival booths, or try a bite from our food vendors while the kids enjoy our activity area, children’s entertainers, bungee trampolines, and more!" "We are excited to announce that our 3rd Highlander Craft Fair has been set for Saturday, November 5, 2016 from 3:30pm-7pm! Last year our Spring craft fair had over 60 vendors participating and over 200 people come thru the doors to shop. 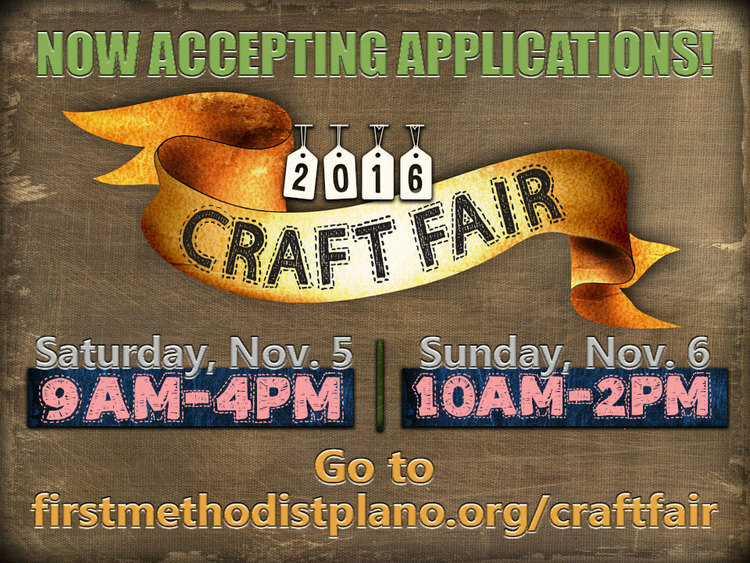 Over the last 2 years, we have had many requests to do a Fall Craft Fair. After much thought, we took that idea and ran with it. 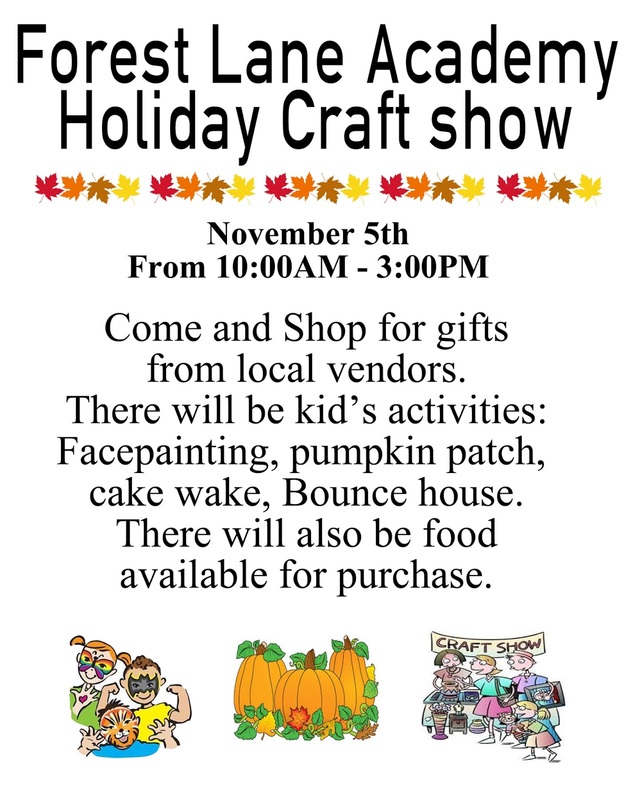 Not only will we be having a Fall Craft Fair, but we will be combining with our annual Fall Carnival as well. This will be an outdoor, street fair style event with food, fun and shopping. Truly something for everyone! Admission is free!" Admission is free, Carnival tickets will be available for games & activities at $.50 each. "The Midlothian Wine & Arts Festival is held in Downtown Midlothian, Tx and features Fine Texas Wineries, Craft Brews, Chocolatiers, Artisans of all styles Crafters and Musicians. This wonderful event features Artisans & Musicians and Food Trucks right on the street and our Wineries are located in local downtown businesses. Each guest receives a Shopping Tote and Wine Glass." 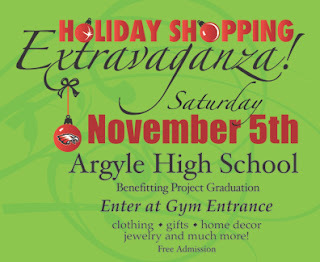 "30th Annual Ryan HS Holiday Craft Show benefiting college scholarships. Hand crafted items preferred Over 100 vendors. Concessions. Set up 7‑9 a.m. with student helpers. Performances by dance studios throughout the day. Two gyms, an open cafeteria, and large foyer. No dead end halls!" "Join us for your holiday shopping! Over 60 vendors, door prizes, concessions and pansy sales! Free admission! A unique collection of hand made art, jewelry, clothing, fall and Christmas decor, home decor and gifts. We also have a nice representation of health and beauty items that are great for gift baskets for clients, coworkers and friends. Market applications will be available on our website starting in May 2016 and all applications are reviewed by a selection committee for approval and acceptance into the Market." "Happy Harvest Marketplace is a one day vendor and craft show benefiting Feed My Sheep Food Pantry."